2: a variety of input and output modes can be selected, often open and close can be selected. 3: rod angle can be adjusted from 55~90 degrees, 10 degree resolution. 5:all kinds of state signal output. 6: barrier gate running state OK signal output. 8: traffic lights signal relay output. 9: external Vehicle detection signal, infrared sensor signal. 11: the Opening time is less than 0.9s. 12: the running noise is less than 60dB. 13: standard boom length 3m. 14: Power consumption: 50W, maximum power 100W. 15:It is also a simple matter to change the handing on-site from right-Hand to left-Hand. no need to use tools, hand can be replaced. input, respectively, the number of corresponding statistics. 18: the RS232 or RS485 connected to PC of the parking system. 1.Are you the manufacturer or trade company? -------We're professional manufacturer who has our own factory in Shenzhen since 2007. 2.What is your biggest sadvantage? ----------Serve motor,support for AC and DC power,only us use this motor for barrier gate in China,rod and operation time can be adjusted,no limit switch,free-debbugging. 3.Why the price is higher than others? 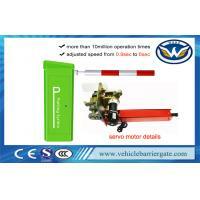 -------This barrier gate combining permanent-magnet synchrous serve motor(PMSM motor),the technology is the mostt anvanced in China.At the same time,we can supply the more cheaper price barrier gate to meet different clients. -------Sample order for 1 set is supported. ---------As for usual order,it is 3-5 days after received your payment with 50 sets order quanlity. --------For OED order,it is 7-15 days after received your payment with 30 sets order quality. 6.What is thr terms of payment? --------30%-40% advance deposite,60%-70% balance beforefor shipment for large quantity. --------Our Warranty is 2 year.